April 1st - April 30. 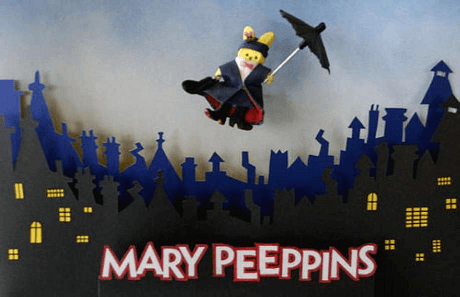 Create a scene from a favorite book with peeps. Open to all ages! Ask staff for details. The Gordon Avenue Library opened for public service on November 19, 1966. It was the McIntire Library's first addition built expressly for library purposes since 1921. 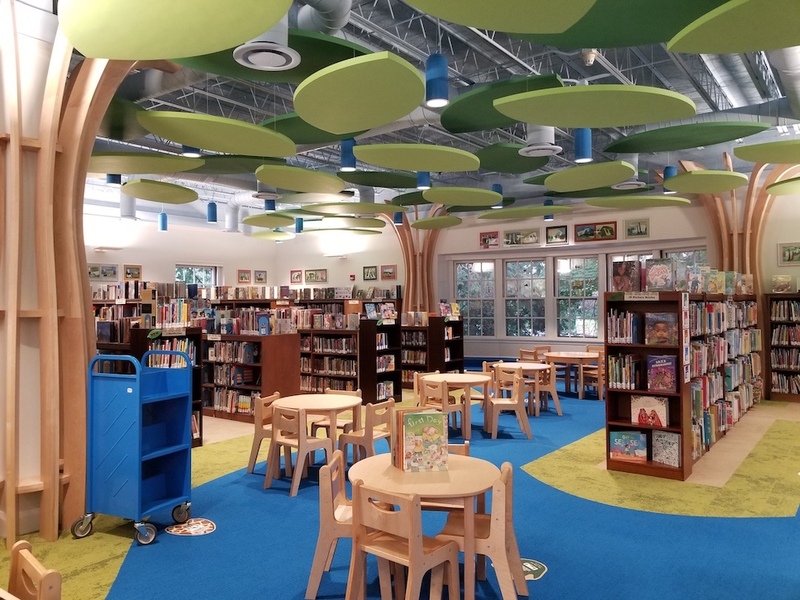 The construction was funded by the City of Charlottesville and Albemarle County, which had been contributing to the operation of the Bookmobile since 1946 and had joined smaller branches in Scottsville (1960) and Crozet (1964) to the city's system. 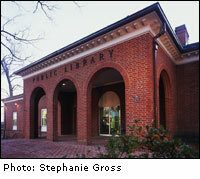 At the time, this new branch was sorely needed to serve a growing population west of the city, to ease crowded conditions at the McIntire Library (which occupied the building now housing the Albemarle County Historical Society), and to provide a headquarters for the Bookmobile operations. Designed by the architectural firm of J. Russell Bailey in Orange, Virginia, the two-story red-brick trim 12,384 square foot building was designed to hold 25,000 volumes (with an additional 10,000 in the Bookmobile "garage" downstairs), seated 38 in the Adult Room and 26 in the Children’s Room and boasted three public meeting rooms, seating 134 in all. The original architect’s rendering can be seen hanging on the wall behind the circulation desk. The Perry Foundation donated the site. Forty-five percent of the construction costs or $120,262 was provided by Federal Library Aid through the Commonwealth. Charlottesville and Albemarle County appropriated $75,000 each. Additional funds were donated by individuals and groups, notably the America Association of University Women, who helped equip the meeting rooms, and the Friends of the Library who purchased a film projector and screen. When the Central Library opened in May 1981, Sunday hours were dropped at the branch, and budget cuts in 1982 made further cuts necessary. The book collection continued to grow, however, and by 1988 the library had squeezed in 54,000 volumes, twice its designed capacity. The South Room, one of the public meeting spaces, and the Bookmobile area were given to the Friends of the Library in 1984 for storage and sales space for their successful annual book sales. Gordon Avenue Library now serves as a donation center for the Friends of the Library in addition to hosting the book sales twice a year. With the opening of the Northside Library in 1991, Gordon Avenue Library lost its role as the largest branch, but it retained its reputation as a welcoming, accessible neighborhood library. Programs for children are varied and well-attended, and the strong collection and flexibility of a smaller branch allow for innovative programming. As many as eight programs a week are offered for infants, preschoolers, school-age children and teens, including a drop-in storytime every Saturday morning. Adults, as well, enjoy a variety of programs such as book discussions, movies, and community groups for handcrafts or games. A bestseller collection to allow quick access to the most popular books; the African-American collection, named for Roland Beauford, an original staff member; and a well-appreciated jazz cd collection; are some of the successful offerings at Gordon Avenue Library. Now, the public computer workstations and public wireless access are used for everything from job searching to social media, educational research and communication. Gordon Avenue Library sits as an integral part of this vibrant neighborhood alive with preschools, Venable Elementary School, businesses, homes and the University. Filled with natural light and a cozy atmosphere, it is a place for students, families, retired people and anyone to stop and stay awhile, discovering favorites old and new. Visit Storystyle's profile on Pinterest.